Where do tulips grow? Is the answer always Holland in your geography books? Many amateur gardeners are wary of bulbs. Strange, when they are so easy to pick up from the nursery, often already sprouting. We’ve grown bulbs such as onions for centuries successfully enough to pack recipes with them. But flower bulbs are relatively less common in our climatic zone. However, chances are new developments in floriculture and technology have brought exotic bulbs to nurseries near you, just in time for winter and spring. 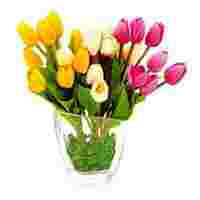 If not, you could order them off the Web at Sknflowerbulb.com and Floraexotics.com. For those who live in areas of high ground frost and snow, these are often early summer blooms. In the Indian plains, however, you grow them mostly in winter (planting around October-November). Go Dutch: Why not grow your own tulips this year? Oxalis: These small corms, the size of a seed, seem to be flying out of the latticed plastic trays at the nursery and into gardens, leaving you to place advance orders for your favourite colour. There’s good reason for their popularity. The corms we planted a couple of years ago are still fuss-free, coming alive every October to throw up cute black-spotted leaves. Now, we’re waiting for the yellow and red flowers that will last a few months. Freesia: This relatively easy-to-grow plant has a heady perfume. Plant the bulb a little lower than the thumb rule: The soil above should be about the same height as the bulb. Freesias tilt less, I believe, if they are planted a little deeper. Tritonia: This year’s recommendation from the nursery. I thought the bulbs look similar to freesias. Sure enough, gardening books call it the Flame Freesia. Clivia: Very pretty, with bunches of robust, bright orange blooms, the clivia is a perfect winter pick-me-up for your borders. Nerine: This comparatively delicate, more ladylike flower is certainly cheerful too. Ranunculus: The flowers are stunning and the leaves, like those of the oxalis, are a bonus since most bulbs and corms don’t exactly qualify as foliage plants! Many of us are wary of bulbs and corms because we hear they need to be rested, stored for a few months, then repotted next year. The first freesia and ranunculus we grew came with strict instructions: Once the season is over, let the leaves be for a while to grow more food. Then snip them down to rest a few weeks. Lift the bulbs and corms out, wash off the soil and germs, rinse in fungicide, dry out thoroughly, store in a wire tray in a cool, dry place, or refrigerate… Phew! We did follow the routine relentlessly for a few years, but the flowers still grew smaller and sadder. Easier to live with is this suggestion from Dinesh Pradhan, owner of the famous Shanti Kunj nursery in Kalimpong: Ask the nursery for bulbs and corms that can be allowed to rest in the soil. “Deal with bulbs individually. Oxalis can remain in the bed. So can Football lilies, Achimenes and Eucharist lilies. When they go dormant, check watering since you don’t want the bulb to rot." Pradhan, in fact, loves bulbs because they are not too fussy. All they need is soil rich with organic manure (he swears by mature cow-dung manure), a well-drained bed and 6-7 hours of decent sunlight.